WHEREAS, any members of the House of Representatives or the Senate of the Legislature of the State of Idaho who choose to vote "Nay" on this concurrent resolution are "FREAKIN' IDIOTS!" 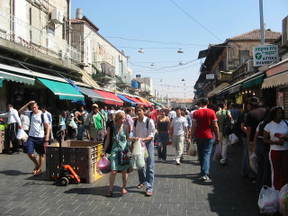 The souk (street market) in Jerusalem on Friday afternoon, with everybody buying things for Shabbat. We bought grapes, strawberries, and fresh-from-the-oven challah. When you visit the Old City of Jerusalem, you understand a lot about the history and relationships between Judaism, Islam, and Christianity. The Temple Mount was the location of the two great Jewish temples of ancient times, and was the site of the Ark of the Covenant containing the stone tablets of the Ten Commandments. 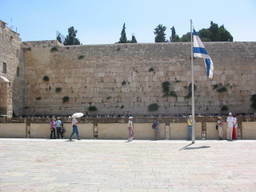 The remaining Western Wall of the Temple plaza is the holiest site in Judaism. (That's vegetation, not burn marks or other damage, that you see on the wall.) But wait -- the former location of the temples themselves on the Mount, right above the Western Wall, is a holy site in Islam and is home to the Dome of the Rock (the golden dome peeking over in the pictures) and Al-Aqsa Mosque (the gray dome). You can stand at the wall with the Jews and hear the muezzin calling Muslims to prayers from the minaret above. And by the way, right next to the Temple Mount is the Via Dolorosa and the Church of the Holy Sepulchre, site of Christ's crucifixion. 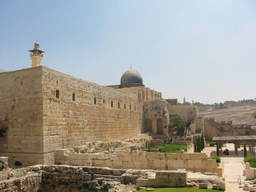 Israeli security works with many different religious organizations, such as the Waqf, to provide access to these sites. And most of the time, it's peaceful there. As mentioned earlier, I just returned from 10 terrific days in Israel. And while I was gone, two products that I've been working on for a long time saw the light of day. Google Checkout went live last Thursday. Google Checkout is a cool service that lets you buy stuff really fast using information from your Google account (including a Gmail account). I wrote the API documentation, which helps merchants hook up their stores to Google Checkout. If you don't have your own online store, but you want to try selling something with Google Checkout, take a look at Buy Now buttons, an incredibly easy way to sell something and get paid through Google Checkout. And also last week, on a more personal scale than Google Checkout, Learn Objective-C on the Macintosh was published as an ebook (paper version coming soon). The estimable Mark Dalrymple of Advanced Mac OS X Programming fame wrote this one, and I went through and polished it a bit. This process reminded me of the way comic books are drawn, where one artist creates the art in pencil, then another redraws in ink, erasing and touching up a bit, so we decided to use comic book terminology for the credits and a comic book theme for the design. If you have any interest in learning or improving your Objective-C skills, I highly recommend this book. Getting Mark Dalrymple to teach you Objective-C is like having Michael Jordan show you how to play basketball. "In 1948, if the McDonald brothers had based their business on selling salads, the sign out front would now read "Burger King"." I'm just back from 10 days in Israel, where I had very little Internet time. I didn't post, but I kept lots of notes, so you might find yourself tortured by travel posts for the next few days. It was a great trip!